Silk Ribbons are on my mind. 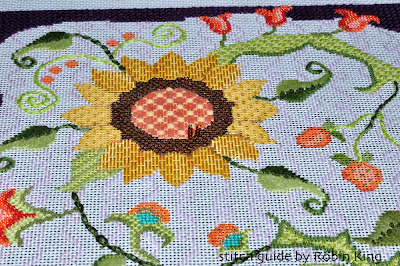 It's time to add the Silk Ribbon technique for the Sunflower and Berries canvas (ND 309). Just a reminder: next month, I will be teaching this class at Nashville Needleworks and In Stitches Atlanta. Give them a call to join in the fun. I have so many things to share with the students. I will also be teaching at The Bristly Thistle in October 2012, too... if that fits better for your schedule and location. Hope to see you there. I used the River Silks Ribbons for this project. It was my first time to use the 13MM size. So lovely. It unfurled off the card and was ready to use. So pretty. 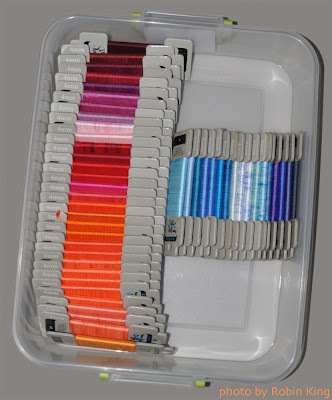 Over the years, my stash of River Silks Ribbons has grown. One might even say... has grown out of control. This week, I decided it was time to find a better way to store and organize my ribbons. After all, they needed... deserved... better respect than to be jumbled up into the same bag. 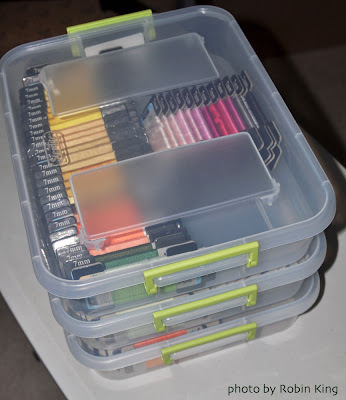 Here is what I found: a nice group of stackable containers. The transparent plastic allows for a quick glance. Now, the 4MM ribbons are separated from the 7MM ribbons. 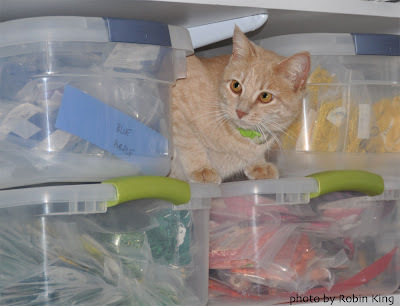 The 13MM ribbons are safe, too. 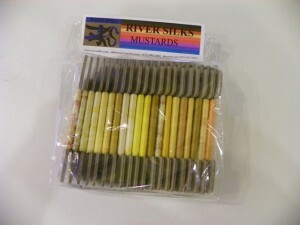 River Silks Ribbons are sold individually; available from your LNS. 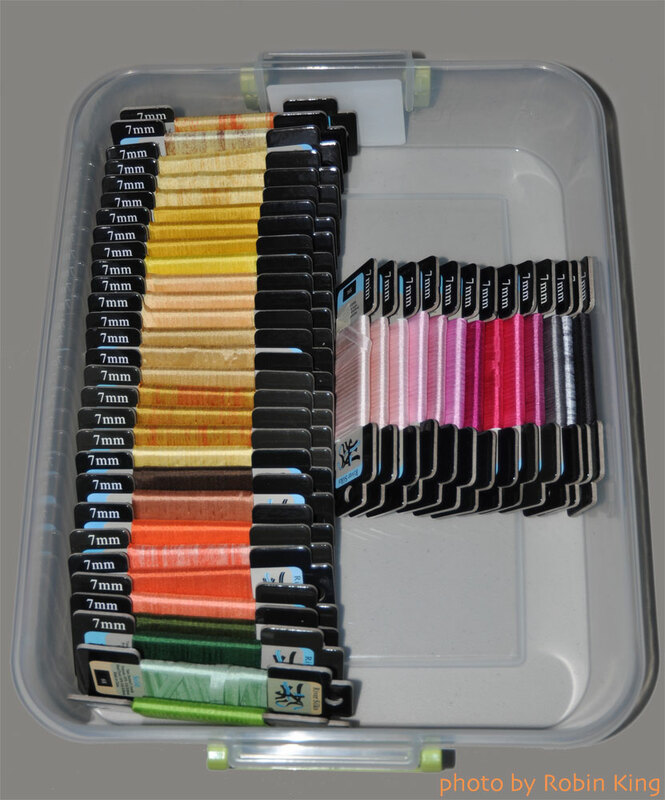 They have over 240 colors; both solids and patterned. They come in 4MM, 7MM and 13MM widths. 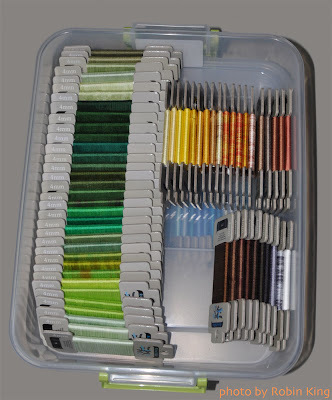 Have you seen their wonderful collections of ribbons grouped by theme or color? 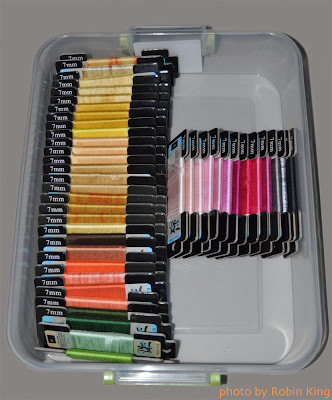 Recently, The Needle Bug (Montgomery, Alabama) posted on their blog photos of the River Silks Ribbons collections which they had in stock. Here's the link: http://theneedlebug.com/2012/01/colorful/ Give Leigh a call. 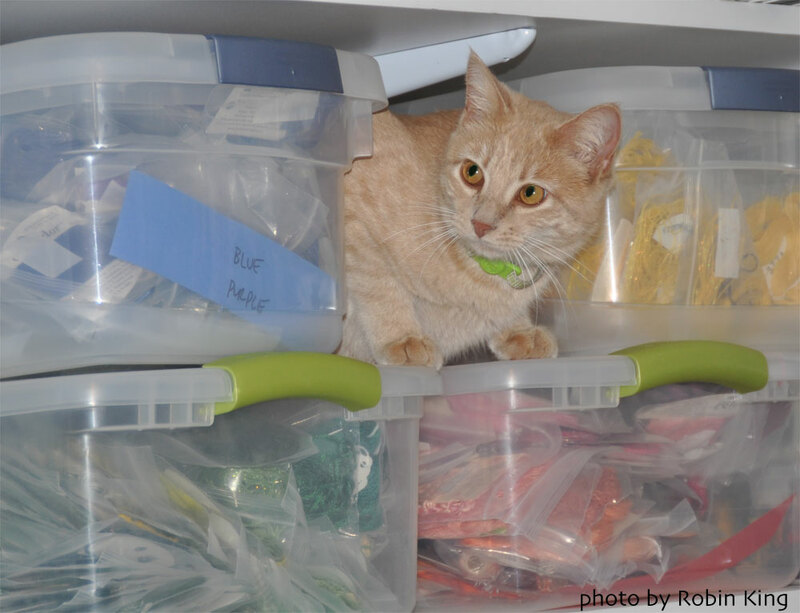 How do you store your ribbons? Separate or together with your other threads? Just a quick note to wish everyone a Happy St. Patrick's Day. 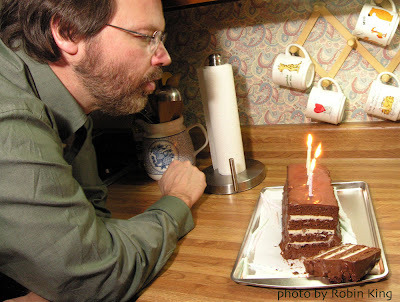 Today is Pat's birthday, too. You remember him... my guy, owner of Business Visuals Photography. I made these needlepoint belts: one for me and one for him, too. He can still wear his. One year, I made him an ice cream birthday cake. It looked a little wonky, but tasted very good. Enjoy the day. Be sure to wear some green today. Or, for those needlepointers in the audience, let's stitch with some green. Sometimes, I look to Nature for stitching inspirations. 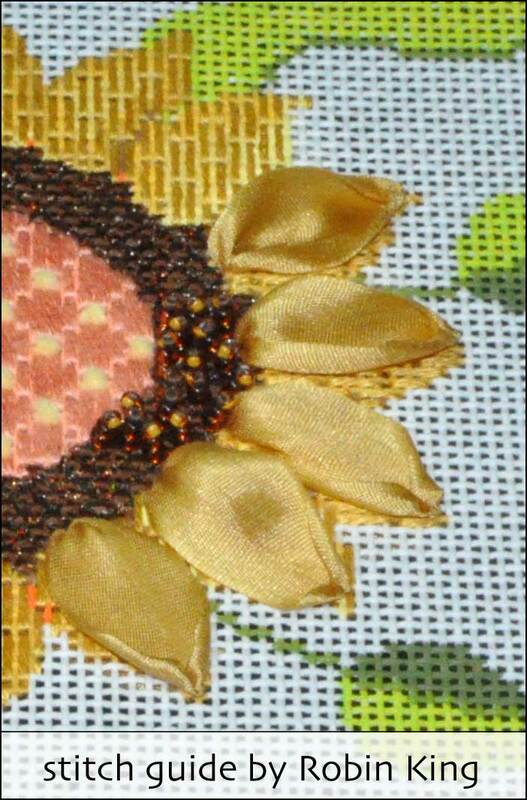 Same was true for the Sunflower on the NeedleDeeva canvas (ND 309). When I am puzzled, I often do an Internet search. 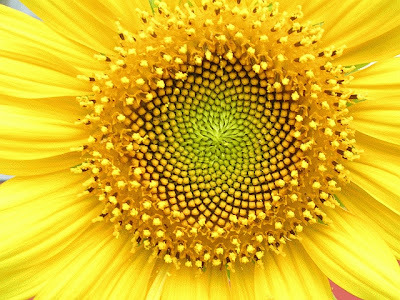 This time, Google lead me to some awesome Sunflower photos; each showing a different phase of the Sunflower's life. My eyes were opened and the light bulb went off when I saw this wonderful detail. This photo in particular really spoke to me. Look at the outer ring... it seems to be taller than the center area. Hmmmm.... how could I make my canvas do the same thing? Stacked Beads, of course! They would tower above the center Seed area... and would still have a nice perspective for the upcoming Flower Petals worked in 13MM River Silks Ribbon. The combination of Mill Hill Glass Seed Beads and Sundance Beads size 14 were the best for telling this story. Thanks, Mother Nature. And, if you notice, I first did a 4-Way Continental stitch in the Brown area. 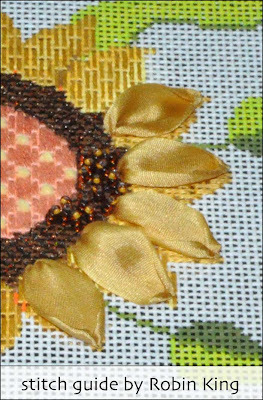 It gave a defined grid which was very user-friendly for placing the Stacked Beads. All in all, I am very pleased with the look. Hope you will be, too. March Madness is right upon us. No, I am not taking about the NCAA Basketball Tournament... I am talking about my needlepoint projects and their looming deadlines. With tonight's immanent time change ... before we spring forward, I thought we could step back in time (together) to see how I came to this wonderful conclusion. The canvas is from NeedleDeeva and it is called Sunflower & Berries (ND 309). 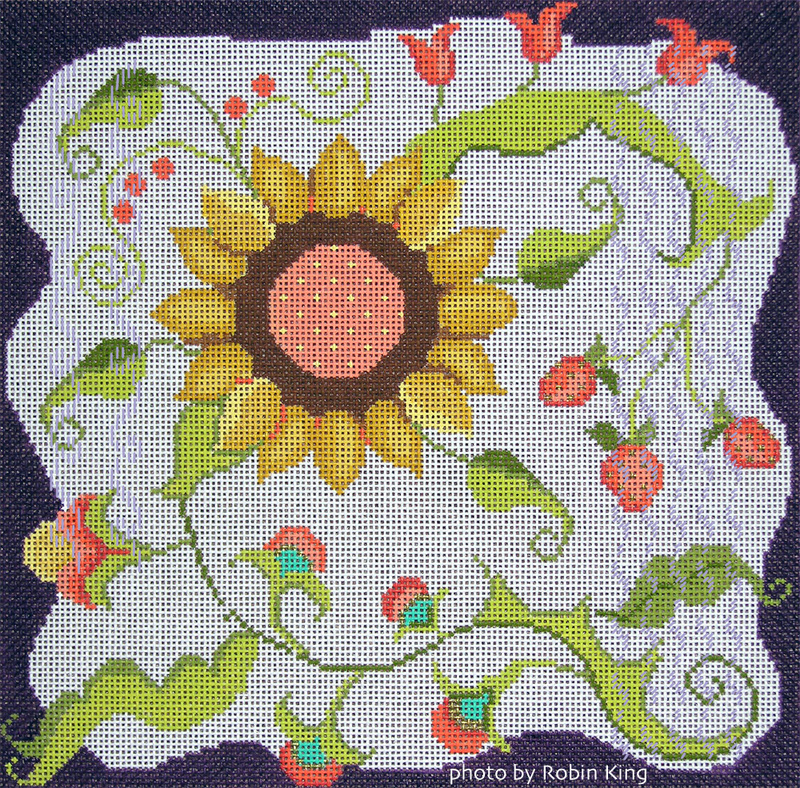 I will be teaching it at Nashville Needleworks on April 21, 2012 as well as at In Stitches Atlanta on April 27 & 28, 2012. I am so excited/honored to visit both shops; I have never been to either. Give Lisa Rusche or Bam Coleman a call and join me in the fun. Can't make it in person? 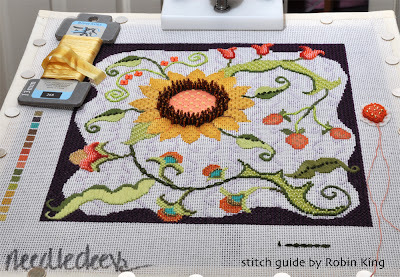 I am sure they can pack the kit up in a wonderful to-go box... plus, the canvas comes with my stitch guide. My next plan of discovery was to work on the background. Judee/NeedleDeeva told me the white background doesn't have to be white... she was just keeping it white so others could add their own color. (I went with a pale lilac thread.) Any of you who saw me work on this canvas at TNNA Phoenix in January knew I was all over the place looking for inspiration. I had an idea in my mind, and that's where it stayed. 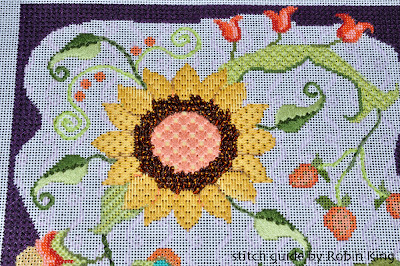 I did a lot of stitch/take it out/stitch again/take it out/stitch/take it out/ponder/stitch/take it out/pondered again... until I could get back in front of my computer. I liked it but wasn't in love with it. Guess it felt too rigid. I tried Crazy Rain, too. After all, both Strawberries and Sunflowers need a good rain to grow, right? I was getting close... but I wasn't playing Horse Shoes. I still had a ways to go. It was the curling vines which continued to call my name. Remember the Mirrored Confetti Ribbons stitch I did for the wallpaper behind the Cake (Associated Talents/DMC)? 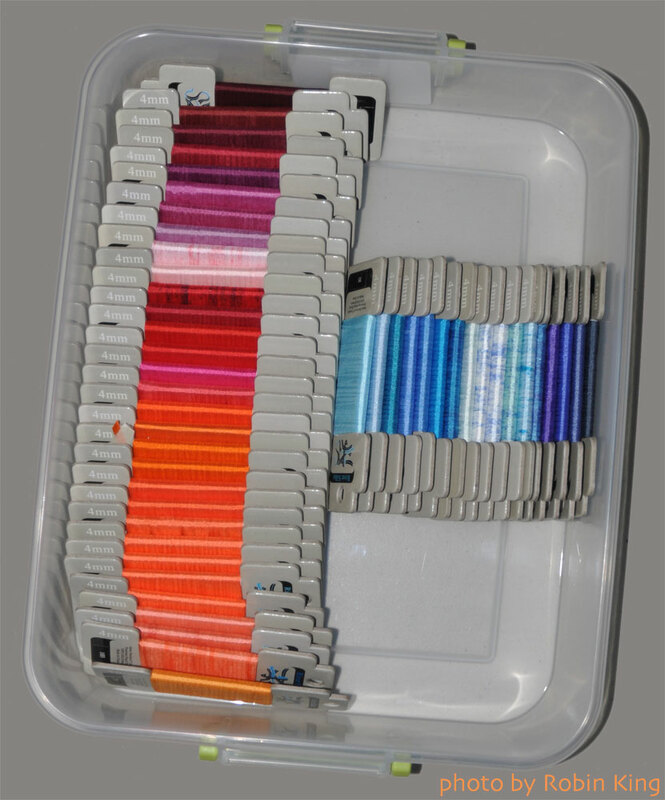 Inspired by Julia Snyder's book, Darn Fillings, I began with her original Confetti Ribbons. But, placing them side by side was too regimented. I am very comfortable with the concept of "open" canvas for the background stitch. 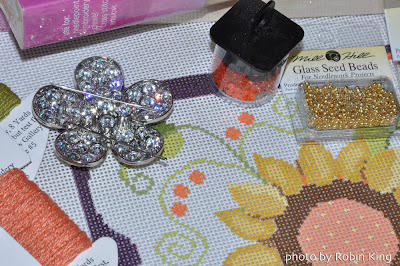 I used Kreinik Braid size 8 057F... it was a nice pale lilac color... easy to use, too. It gave a texture, and didn't get in the way. Bonus: it glows in the dark... who knew? Certainly made this "Halloween" kid happy. I need a fun name for my background stitch. Add your suggestions in the comment box. Next time, I will share with you more details of the Sunflower & Berries. Its design size is 8x8 on 18 mesh canvas. You will really have a fun time with this one!